For the past few years the production of gold has been flat, while the demand from investors and central banks has been trending upwards. A recent article by Steve Wilson from 247Bull highlights the supply and demand fundamentals of the gold market and how it’s been impacted by the recent drop in price. The key points of his article are listed below. According to the CPM gold year book 2012, world annual gold production has been flat for the past four years. This trend is confirmed by data from the World Gold Council who note that during 2012 the supply of gold actually contracted by 1.4% to 4,453.3 tonnes. The chart below shows quarterly gold supply over the past three years. 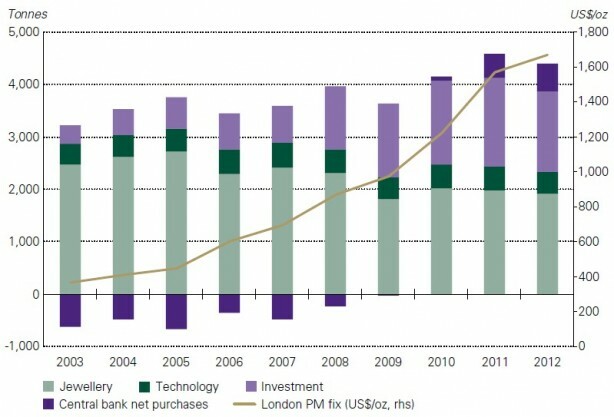 The recent growth in demand for gold has come primarily from the physical bar segment of investment demand as well as from purchases by central banks. Although gold demand was down 4% in 2012 versus 2011, it was still 15% higher than the average level seen during the past five years. Demand totaled 4,405.5 tonnes, which on a value basis was an all-time record of $236.4 billion. The table below shows annual gold demand over the last 10 years. 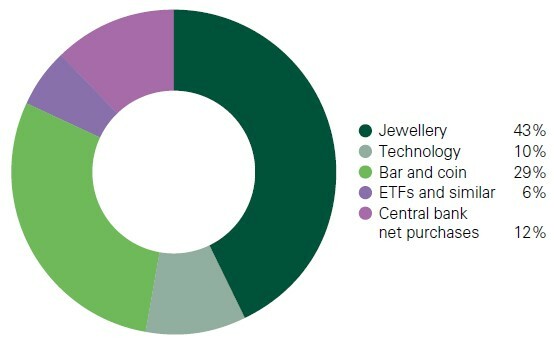 The chart also indicates the source of the demand, i.e., Jewelry, Technology, Investment or Central bank net purchases. In the case of the gold market the supply and demand at the margin is set by those who are selling their metal and those that are looking to buy it. Bloomberg reports that Russia and Kazakhstan have boosted official reserves for a sixth month, and according to the World Gold Council, central banks will buy as much as 550 tons this year, the most since 1964. The record buying in the physical market has triggered a swift reversal in the gold price which has risen from a low of $1,321.50 on April 16, 2013 to $1,472 per ounce on April 29, 2013. Gold is an asset that tends to be held by those that see the economic and monetary “big picture”. Individuals who see the link between record debt, rising deficits, high unemployment, weak economic growth and the destruction of paper currencies are happy to step in and buy gold when the paper price is brought down. American Bullion specializes in adding gold to individual retirement accounts. To learn more about your options, call 1-800-326-9598 to speak with a precious metals specialist.